Oh the day is here, let the hauntings begin. I haunted Ms Charlotte's email box this morning with a note that she was picked as my winner for this "Wicked Blog Hop". Sorry, I don't really have any halloween tricks. Not my thing. I do love your quilt. It is AH-MAZING!!! Mr Random.org picked number 9, this time. You had to get up early in the morning to beat Ms Charlotte! LOL! Bloggers Quilt Festival time again! I am so happy. It gives me a chance to see old friends as well as make new ones. I just love this time of the year. Bloggers are so inspirational. I find myself lost in the sea of patterns, color and design. So much motivation, so little time! Amy, you have found a way to entice us all into this wonderful world. I don't suppose you would be a doll and find us a few extra hours in the day too?? I have an applique quilt I would love to share with you. Fusible applique has long been my favorite method of quilting. Things just take shape so quickly. Thru my blogging, I was introduced to a fabulous web site in Australia, called the Quiltery. (it's linked for you) They have the cutest darn patterns I have ever seen. This one caught my eye, and I knew it had to go right to the top of my list of holiday projects. I fell in love with the soft colors and precious faces. Tiny buttons and embellishments make this quilt come alive. I learned a valuable lesson while making this. I've always been a matchy matchy kind of girl. I change out my threads with every color change on my appliques. Something fell short though, it just needed something, to kick it up a notch. I got out the black thread and ended up going over everything again. I highly recommend you check out The Quiltery . The cost of a years membership is nominal, and patterns are fully downloadable. Oh, I live for those things! They even offer designs for embroidery machines. I noticed there's been a lot of interest in this quilt recently. Some have inquired as to where to find the pattern. Unfortunately, "The Quiltery" is no longer in business. to close their business doors over a year ago now. I for one miss them dearly! I had this little project started, when Amy sent out that email reminding us of the upcoming "Blogger Quilt Festival". Whew, I had to step it up, to finish in time for it. Day and night, night and day, even on a trip to New Mexico to see the International Balloon Fiesta... My machine was with me, and running every spare moment! I heard from quite a few of you, that you knew just what I was up to! For those who needed another clue... Well, they swim in pods! Bonnie Hunters "Orca Bay". You knew it all along. I downloaded all the instructions a couple of years ago, when it was a mystery quilt (it's now in Bonnie's String Fling book). Needless to say, it was no longer a mystery to me. The only real mystery was, when was I going to start on it! LOL!! Once I did, I was hooked. to the wonderful secondary designs that emerged as I stitched. 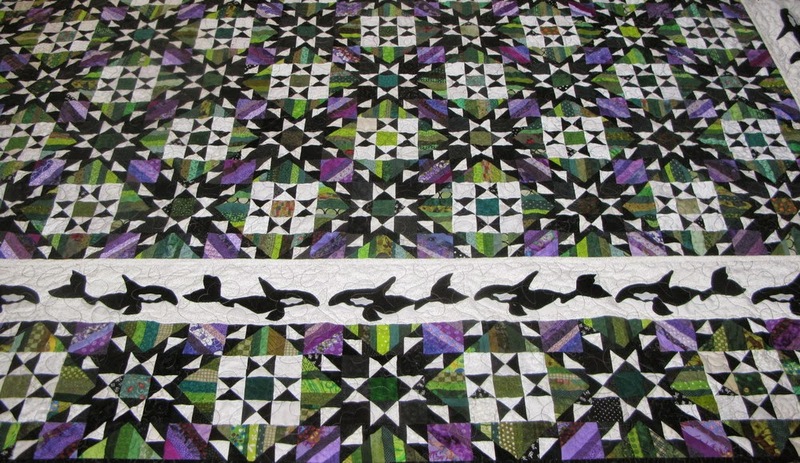 Just one problem, after cutting out and stitching 448 black and 448 white hour glass units, 350 black and 350 white triangle units, another 700 black (oh yeah, you read it right), 112 black, 112 white, and 56 green 2 1/2"squares. I decided that I loved it so much, that it was going to need to be much larger than the 74.5 x 84.5 quilt it was. Back to work I went cutting and stitching, not one more entire quilt, but two! I can't even make myself do the math for all three now! You see, I wanted a big quilt. A really big quilt. So big in fact that it lead to another problem. My bed is a California King that sits very high off the floor. I wanted this to be a bedspread, but my long arm, can only accommodate about a 100" wide quilt, and that is stretching its capability. What to do, what to do??? I dug out my old McKenna Ryan "Rhythm of the Sea" pattern for them. With the use of my favorite, Quilt As You Go (QAYG) method, I was able to add extra borders, to this to get the width I needed. You can find additional posts on stretching a king size quilt, here on my blog! It really ended up being a little bigger than what was necessary, but I wanted to keep enough of the design continuing on, under the border. So there you have it, a super king size scrappy quilt! The final size is 125.5" wide x 117" long. It's a biggie. I am thrilled to say, the only fabric I had to purchase was the 12 yards of backing I used. Thanks to Bonnie Hunter, I was able to use up scraps for this guy! It really is amazing just how much Bonnie has taught us, in maximizing the use of fabric scraps. Bonnie was in Denver the day this was finished. I so wish I had been in her class. The waiting list was long, and I just didn't make the cut! LOL, but I have my piece of Bonnie right here, and thrilled I am. Hope you have enjoyed my journey thru Orca Bay. She shares loads of free patterns on her site, as well as sharing all her scrap saving tips! Check it out, I'll bet you have a quilt or two worth of scraps in you sewing room too! A very big thanks to Amy for hosting this wonderful hop. Where we all get a chance to see old friends, meet new ones and just relish in the eye candy, that everyone has to share. Make sure you visit all the other bloggers participating! You won't be sorry! You know that nothing in the world, tickles me more than Halloween. 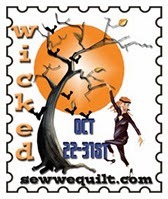 Nothing accept that "SewWeQuilt" blog hop that Madame Samm and Wendy cook up every year! Here's a 21 broom salute to you both! Introducing to you, FIDGET, the Fairy Princess Witch. although the jury is "still" out on that one, though! You must admire her sparkle wings, made out of none other than screen door fabric though! Those clay noses are such a hoot. Imma keeps her constant companion, with her at all times! These girls are patterns from Hollyhocks & Ivy in Draper Utah. They were both watching over me, and prodding me on to finish up my project for the hop. It's a BOM from Pearl Louise Designs, called Boo Hallow. I got these patterns as a gift last year frommy quiltin sista. When I went to start on the project this fall, I only had 11 of the 12 patterns. She had purchased them at a Quilt Expo that was in town. After failed attempts to contact the seller, I decided I had to come up with another option. Enter, the delightfully talented and generous Rhonda Ravelly. She shared an assortment of haunted houses, she designed on her blog. If you've never seen Rhonda's blog before, her name is linked for you. You really need to visit her. She has the CUTEST darn things, and she shares all the time. The word on the streets is, that Rhonda will be showing off her latest Wicked creation on the 28th, can't wait to see that one! I enlarged one of her houses and was able to add it to my quilt! Rhonda, you saved the day! I could have ordered the missing pattern, and waited, but I was ready to start and you know how us quilters can be sometimes. Now, I'm so embarrassed. As I sit down to write this post, I am looking for the patterns to give you all the information. Since the water damage with the rains last month, my sewing room us turned upside down. Can I find the patterns anywhere??? Heck no, but what I did find was that missing haunted house pattern! You know, the one I claim I never got. So glad I was not able to connect with the seller! LOL!!!!! It's all good though, because I love my special "Rhonda" addition to this fun BOM! Sorry Pearl, and thanks Rhonda, what else can I say! My challenge on this, was that I chose to use a couple of fat quarter packs a friend gave me a couple of years ago. I love these fabrics and were saving them for something special! None of them were Halloween colors. Changing out all the colors to make them work was a fun! It makes me happy to be able to do a little stash busting! and these guys seem pretty pleased too! Did you happened to notice the dress on Fidget? I love this fabric. It just makes me laugh. It's from Moda, and is called Witches Undies. Now that you've made it this far, no good "Wicked" hop, would be complete without a give a way. Leave me a comment, sharing your most wickedly scary Halloween tricks. Just for the records, trying to trick an exhibitor into thinking they didn't give you the complete set of patterns is already taken! LOL!! Oct 31, the last day of our hop, I will be picking a winner for this delightful panel, called Frank-N-Friends. (A Henry Glass fabric) While I know its to late to make it for this year, just think you'll have a start for next years blog hop! Wishing you the Happiest of Hauntings! Witches undies scarey screamy, have a Happy Halloweenie! Oh it's my favorite time of the year. The time I can drag out my broom and let the real me show thru! Make sure you visit all my friends from now to Halloween. We've been boiling and boiling, trouble and toiling just for YOU!! Before you head out to visit my friends, I just wanted to share the table runner I sent my swap partner in the Quilted Table Halloween swap! I'm just a little batty I know! But the holidays make me this way! Nothing beats a great trip, more than "fun" mail when you get home! This past week was a fabulous one. I arrived home to find this bright and beautiful, Halloween Table runner in my mail. If the top isn't just the best, the backing is will certainly put a smile on your face. 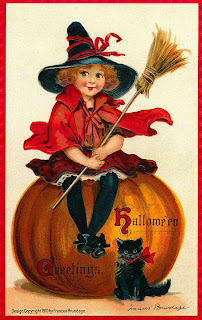 I just love the adorable little witches!!! Bet your wondering just who sent me this, and why???? Well, it was none other than the wonderful Ruth in Pasadena MD. Quilted Table Yahoo group hosts swaps 4 times a year, and Ruth had my name. If the table runner wasn't enough, she also send me fabric postcards to send to my friends this fall! Now how cool are these? I also found a package from Connecting Threads. Seems like our friend Bea, over at BeaQuilter picked me as a winner of her give a way for the Twist to the 60's blog hop. Wow, thank you sew very very much! They are fabulous! Yes, I have been to the International Balloon Fiesta in Albuquerque, New Mexico. It's an almost annual trip. My BFF lives in Albuquerque, and in the past 35 years, I have only missed 2 fiestas. But when you see these things flying overhead, it's all worth the early hours too! Balloons have come a long way... this one has 3 sides. While impossible to get photos from all three, there were 2 decent ones I managed to get. The eyes on this were truly a work of art. It was so real looking that it almost looked like it was watching you as it flew overhead. I would have loved to make these photos larger for you to see, but blogger seems to be having issues today. It is determined to only let me enlarge 2 photos.